When tricking out a kids room in skater style you want a few well placed pieces that are so cool even the kids will dig them! You can’t go wrong with a mirror as cool as this! it’s the perfect accent for any teen or tweens room & features a super sleek look. The Skater Decor Mirror is made from stainless steel and mirrored glass, as well as genuine skate trucks. It comes with a pack of skate stickers to customize the front. You can hang it vertically or horizontally or simply prop it up in the corner of the room. The mirror Measures 7-1/2 by 5.1 by 29-3/4 inches. FYI Never skate on the skateboard mirror…seriously just don’t. Once you go skater you might as well trick out a wall! This Skateboard inspired wall decal comes in 6 sizes from 18″x13″ all the way up to 60″x42″ Making it perfect for just about any kids wall. 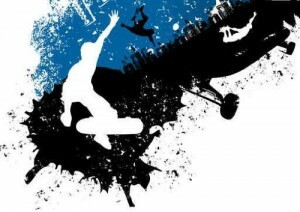 It features a bright blue and black splatter painted design with a skater design cut into the pattern. The white shown will be the wall color. This is an easy to install peal & stick style design that won’t damage the walls. So your kids can have his radical skater decor & it won’t mess up your security deposit or resale value! Kids love posters! it’s a super easy & cost-effective way to spruce up those boring walls. 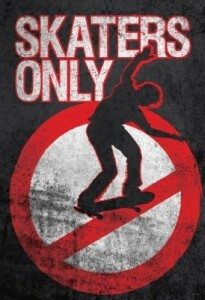 This one features a Skaters Only theme with a rustic vibe those little hooligans will love. For under $10 you get a great piece of Skater Decor. Tack it up or make it look a bit more polished with a Snazzy Poster Frame. 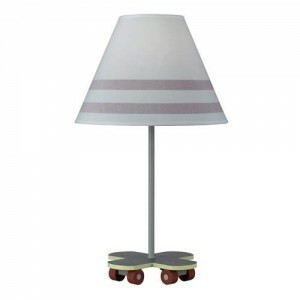 Even rough skaters need a cool lamp…and this one has some serious style! It’s perfect for any age & features a lamp base with shade. The skater lamp is 21″ tall and the base is 8″x8″ wide. You can’t go wrong with this one in any active kids room.